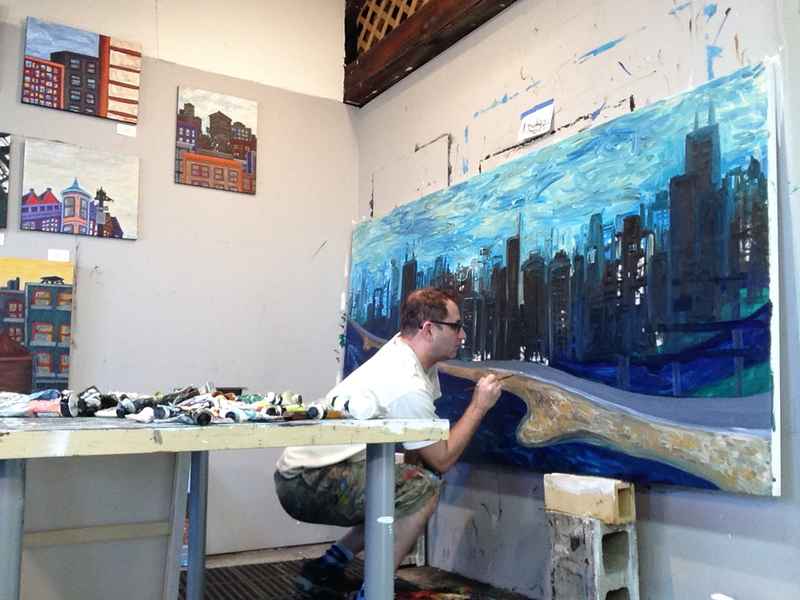 I recently started work on a large cityscape on panel. 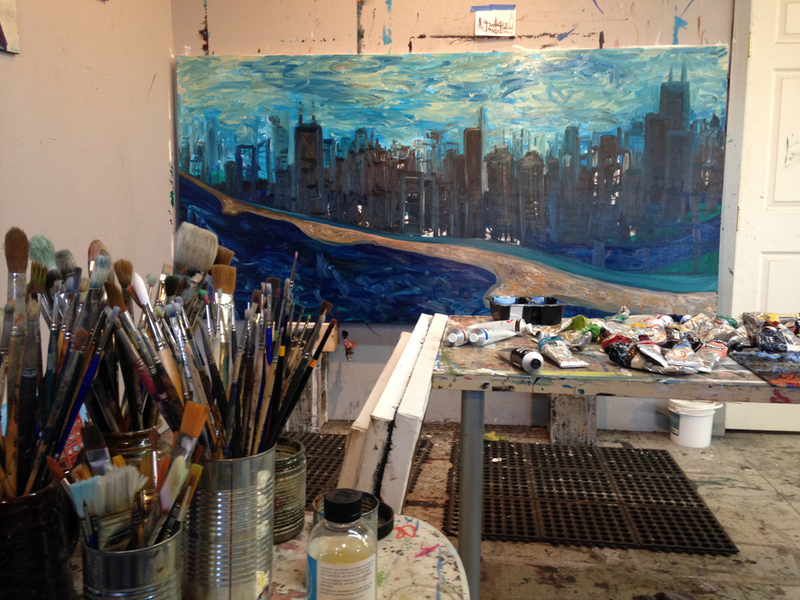 This work in progress measures 4'x8' and using oil - my current preferred medium. It's based on a thumbnail sketch I created from a photo I took of the skyline. While the photo was taken facing east toward the skyline, the painting is looking west from the lake. But, depending on where you are along the lakefront, you'll see the same positioning of the larger buildings as you would looking from the west toward the lake. Click on the images to view larger. This project was for Xavier, a new apartment complex in what used to be Cabrini Green in Chicago. Special thanks to Ann Hudner, the art consultant who curated the project. These are images of a digital reproduction of a collaboration painting between myself and artist Scott Simons. 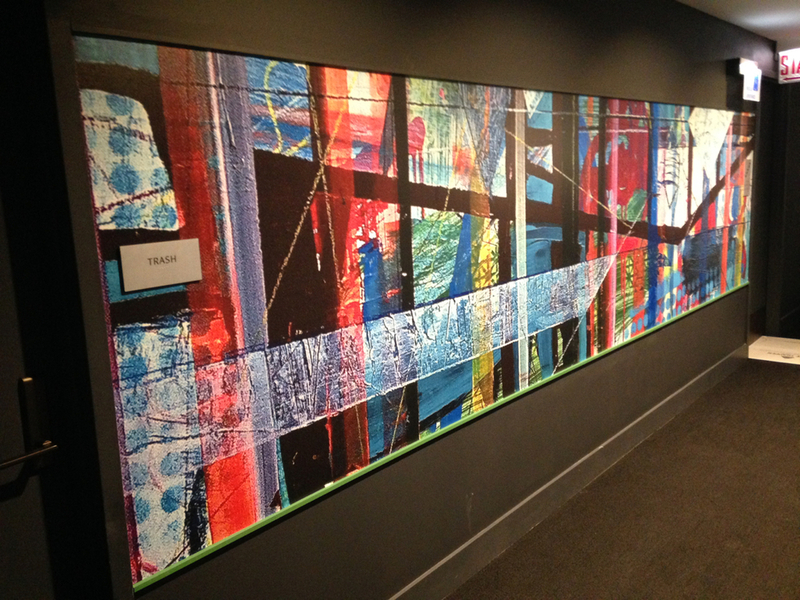 The large abstract wall coverings are installed in all 18 floors of the building directly outside each elevator bank. "Sunflower Slow Drag is a collaborative mixed media painting by Scott Simons and Kevin Swallow. This piece combines Simons’ abstract textures and lines with Swallow’s cityscapes and abstract graffiti style. Both artists are influenced by architecture and draw their inspiration from the urban landscape. This is their first collaboration. The painting references a jazz song, Sunflower Slow Drag by Scott Joplin. Like jazz, the painting was improvised. They passed the painting back-and-forth over the course of a week – reacting to each other’s lines, marks, and colors. The panel was flipped and turned in various directions as they worked, until the painting unfolded into a finished composition." One of the half dozen paintings in progress that I've been working on is starting to take more shape. The composition comes from the view looking south from my studio rooftop. The water tank is on top of the old Pencil Factory Lofts a block over from my studio in Roscoe Village. I've added more buildings in the background, giving it a more claustrophobic feel. The next Open Studios event at the Cornelia Arts Building is coming up! Stop by my studio #201 on the second floor. I'll be showing new paintings that I've been working on over the past several months. Art on two floors, guest artists, and food from DönerMen food truck in the parking lot. All open studio nights are free and fun for all to enjoy. Close to public transportation, free parking available! I realized recently that I haven't blogged since September. I've been creating new work consistently so I'm not really sure why I haven't posted - maybe I just needed a break. I've also been using Instagram more and posting my art on Facebook. But, I always find it helpful to blog about my art. These new pieces are based on photos I took while walking around The Loop at lunch or on an afternoon coffee break. Old factory buildings from the industrial era are rapidly disappearing. But, space is at a premium so many of these structures get converted and re-used for creative businesses -- tech companies, advertising and marketing agencies, and of course, artists -- re-purpose these loft buildings. My studio is located in one of these old loft buildings, originally an ice house built in 1910. But, those art studio buildings are disappearing around the city and the artists often get displaced. These paintings both document and pay tribute to our industrial past and our creative, high-tech future. I put a video recap together of my Firecat Projects show. If you were there at the opening or closing gallery talk you may see yourself! If you weren’t there, this is the next best thing. Created with iMovie on the iPhone. Enjoy! This Must Be The Place - Cityscapes by Kevin Swallow. Solo show of paintings at Firecat Projects - Chicago, IL. July 24-August 22, 2015. Sights, Sounds and Sensations of the City is a juried exhibition of work from the Cornelia Arts Building artists that will be on display across town in the State Street Gallery at Robert Morris University, bringing these distinct neighborhoods, known for their appreciation of the arts, together in celebration of Chicago Arts Month. Well, these past few weeks has been really great and way beyond any of my expectations. The opening night show at Firecat Projects was well attended with family, friends, coworkers, and lots of local art fans. Having such a cool mix of people at the opening really made the night for me! Check out the photos here - all by Mariah Karson. The platform and community that Firecat Projects has created - along with the support and sponsor of my show - Doug Sohn, has been awesome. Firecat’s business model is very unique, artist-friendly, and I’m grateful to have had this opportunity to display this body of work. There has also been some exciting and unexpected press coverage for the show; with a profile in the Chicago Sun-Times, WGN Radio - Outside the Loop, DNAInfo, Chicago Magazine mention, and today - capped off with a review in the Art section of New City. I could not have asked for a better first solo gallery exhibit in my hometown of Chicago. This Must Be The Place for sure. Next up is the Closing Reception & Gallery Talk with author Bill Savage - happening this Sunday, August 16, 3-5pm. Savage, who teaches Chicago literature at Northwestern University and the Newberry Library, will discuss Accidental Beauties: the Aesthetics and Symbolism of Water Tanks (and Other Antiquated Infrastructure). Can’t wait to hear what he has to say! I hope you can make it out to the gallery for the closing reception. If not, you’ll still have some time - the show closes August 22. Or, you can view a slideshow of the paintings in the show on the Firecat Projects website. I finished this painting over the weekend and it will be on display at This Must Be The Place at Firecat Projects, opening this Friday night July 24. 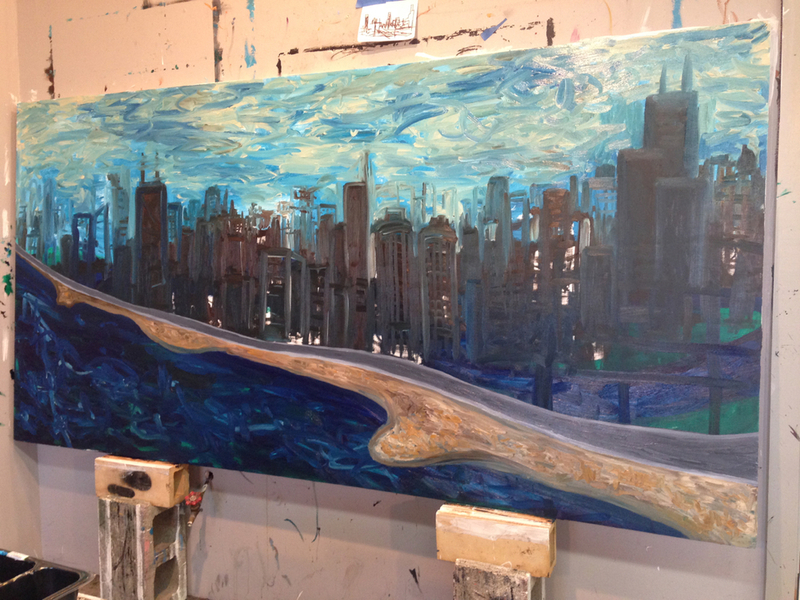 It's based on photos I took along the South Branch of the Chicago River. This is also not far from the part of the river known as Bubbly Creek because of all the industrial sludge, stockyard waste, and raw sewage dumped into the water from the surrounding factories. From Wikipedia: The creek derives its name from the gases bubbling out of the riverbed from the decomposition of blood and entrails dumped into the river in the early 20th century by the local meatpacking businesses surrounding the Union Stock Yards directly south of the creek's endpoint at Pershing Road. It was brought to notoriety by Upton Sinclair in his exposé on the American meat packing industry entitled The Jungle. The exhibition is generously sponsored by Doug Sohn of HOT DOUG’S.